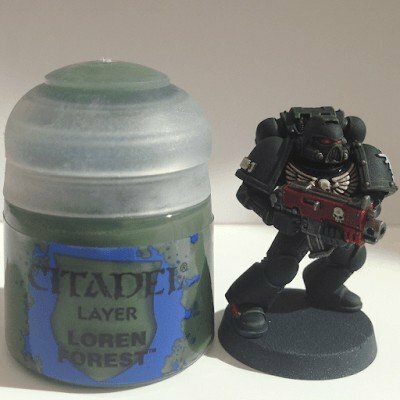 So, here I am with my first tutorial, Painting Dark Angels. I always loved my Dark Angels to be really dark. 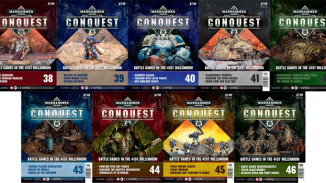 I like darker schemes in general as these guys are at war, the brighter schemes never really fit-in for me. 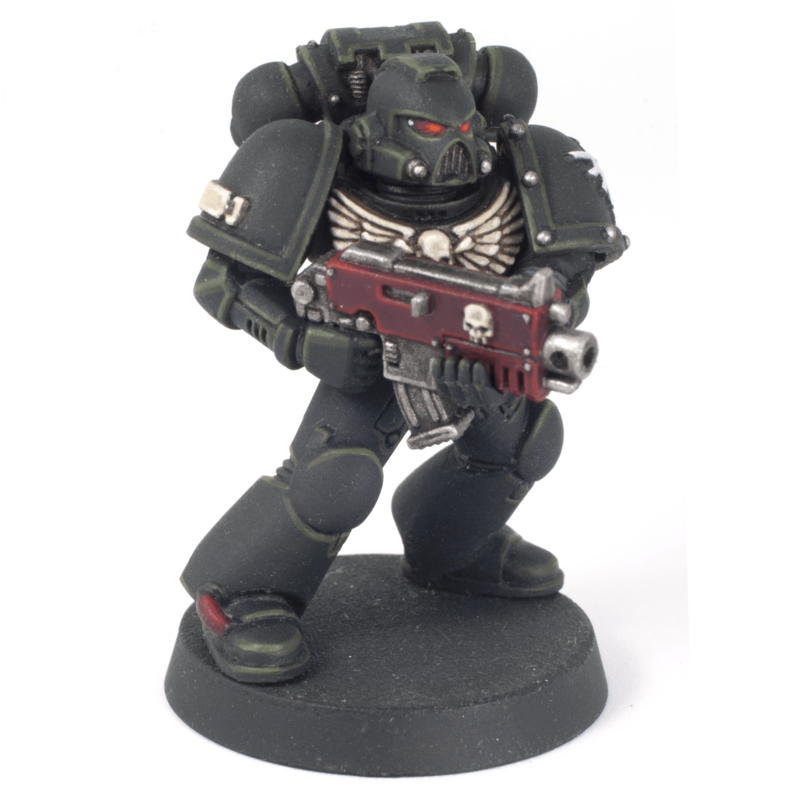 Back in the day, I would always paint my Dark Angels with a mix of 75% Dark Angels Green and 25% Chaos Black as a basecoat, then I could use a 100% Dark Angels Green as a highlight. (Which I literally just dry-brushed over the whole model). 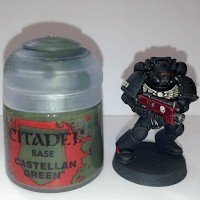 But alas, the old Dark Angels Green is gone and now we have Caliban Green which is certainly brighter than the old Dark Angels Green. 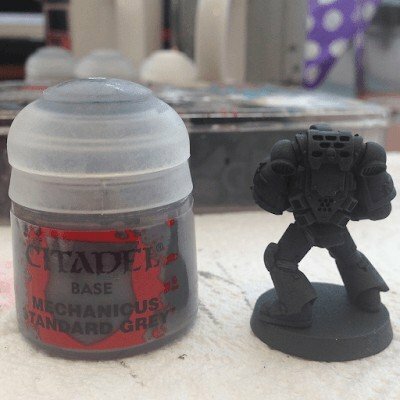 So, in wanting to keep in with my old scheme I devised my own painting method and tried it out on a practise-marine (I now have a Squad of 10 along with the Dark Vengeance Marines following the same pattern). 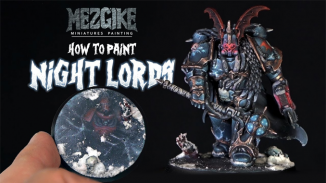 FYI, on the grimdark scheme front, I’m also following this tutorial to paint some Space Wolves. 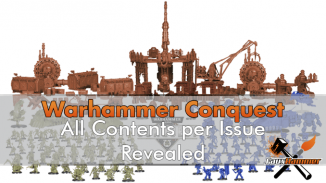 But before you scream at me that Dark Angels and Space Wolves hate each-other. Well, these guys have been stood next to each other on my table for over a year and neither side has so much as batted an eyelid. Basecoat – Not shown as I forgot to take pictures (oops), but it’s fairly straightforward. 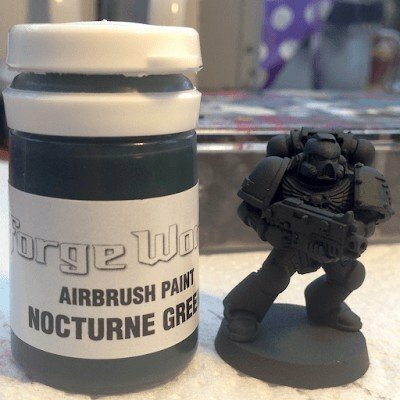 Mix 50%-75% GW Nocturne Green (it’s a Forge World Airbrush Paint) with 25% – 50% Black (I used more black primer because it’s already mixed to go in my airbrush) Spray the model from a horizontal position only so you are only spraying from the sides. Spray 100% Nocturne Green from a 45° angle down onto the model and directly from above. (maybe do 2 coats). The last 2 steps will create a natural highlight from above, it’s really subtle. From beneath the model will be purely black and it will gradually move to a dark green when looking from above. Next paint the recesses. 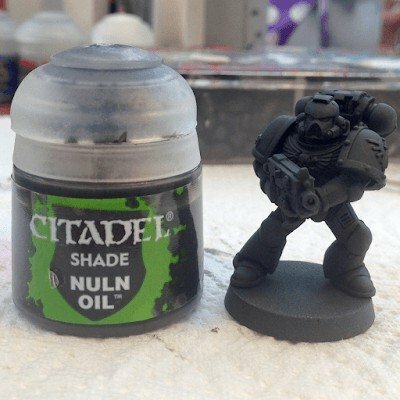 I did this model with Nuln Oil, but I actually moved to Agrax Earthshade on the rest of the squad. This is to make the armour look dirtier and not just black/green (has a bit more character). This again is really subtle but brings out the shape. Next, pull the arms and backpack off (BWAHAHAHAHA). But seriously, I like to really get into the details. And I don’t have enough directional brush control to paint all these parts properly when they remain connected. 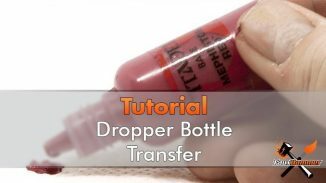 But they need to be connected for the base coat so that the shading hits from the correct direction. You could just use blu-tack instead of glueing the part on in the first place, but I find that pieces still move about when airbrushing). I pulled the shoulder-pads of the arms in this model, but I’ve stopped doing that now. 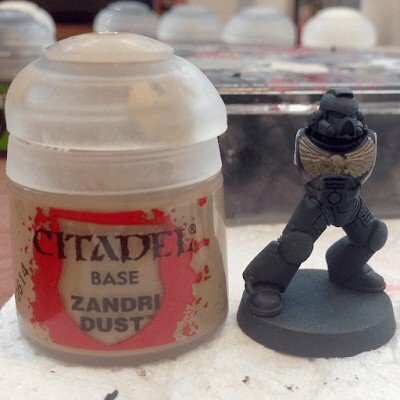 Paint the Bone/Cloth Areas with 2-3thin coats of Zandri Dust. I’ve since done the whole squad this way. I’m now thinking of moving the cloth to a different set of colours. Maybe Rackarth Flesh and Seraphim Sepia, just to make the cloth different to the bone of the Aquila. I love the Aquila in bone on these models. 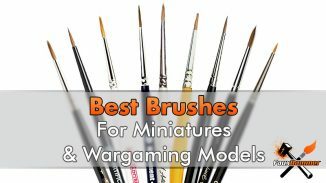 Paint the Ushabti Bone Areas with Agrax Earthshade. not just the recesses this time but the whole area. I like to be a bit excessive on the edges here between the bone and the green armour. This is to hide any inaccuracies in the paint. Paint the Boltgun. 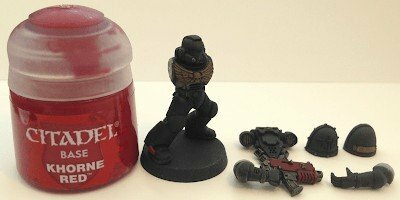 What I forgot to show anywhere in this tutorial is painting the recesses of the red areas with a shade. 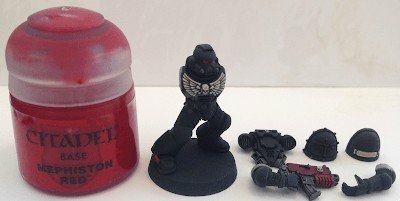 I used Nuln Oil again in this model but since use Carroburg Crimson. Note: Now you can probably see a white-ish powder appearing on this model and you’ll keep seeing it build and disappear throughout the tutorial. This is because of my hands’ sweating (eww!). So I wear surgical gloves to prevent it. These ones were powdered and kept getting powder all over the model! So every few steps I wash the whole model down with water and dry it off with an empty air-gun. 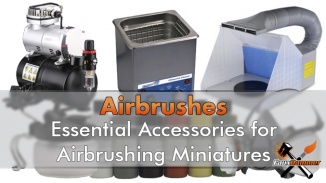 Note: When using this colour and thinning it, be careful because it can run into the recesses if it’s too thin! If this happens, have a brush at hand you can dip in clear water (you do have 2 water pots at hand at all times don’t you?) and water it right down. Then dab it off with some tissue, drop some “thinned” Zandri Dust, then Agrax Earthshade back in the recesses (or just some Agrax Earthshade, but 2-3 coats). Paint all of the edges in Screaming Skull, I tend to focus the light on upper edges so that it is consistent with the Zenthial shading we did in the first few steps, but, as the Aquila is raised in the opposite direction, I paint the bottom edges and outer-sides. With the parchment on the shoulder pad, I paint thin lines along the top and bottom edge but make the top lines a touch longer. 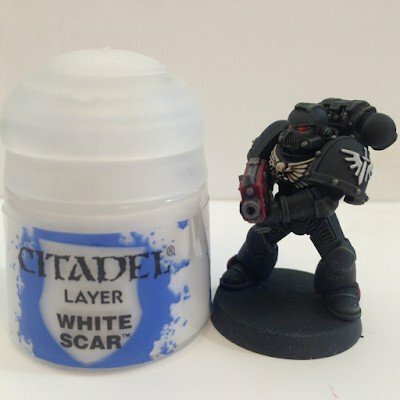 (oh look, I remembered to put Khorne Red in the eyes now) Paint “points” of (thinned) White Scar. Only on the highest points, so a dot in each corner of the parchment on the shoulder pads, a point on each bone on the Aquila crossbones and the upper-left skull edge (my left not the Marines). and tiny points on each of the Aquila’s spines. Note: at this point, I’m really happy, but a little terrified. Because after that fine work I’m going to screw something up! 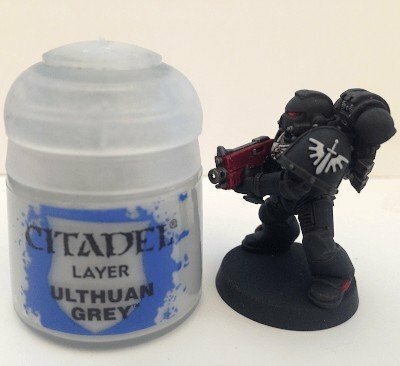 Back to Leadbelcher, as the Nuln Oil shade was painted over “all” of the Leadbelcher earlier, it has “all” been darkened. 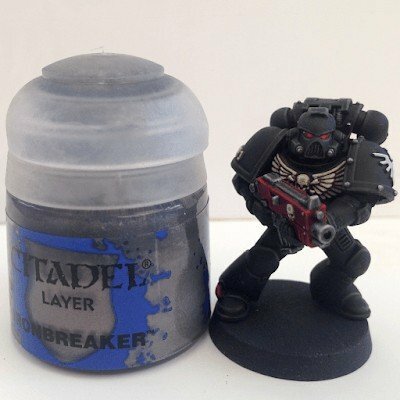 So we can use Leadbelcher again, this time as an edge highlight. Again, this is a “base” paint, so thinning is very important at this step. I use the edge of my brush to do all the details here. 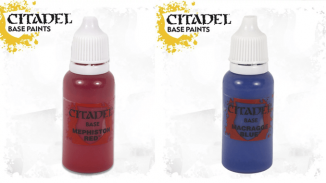 We are back to painting “points: of colour, this time in Evil Sunz Scarlet. So, the front of the eyes, and a thin line on the cable. Both in the middle of the Mephiston Red line painted a couple of steps ago. Also, the front and rear corners of the Boltgun get a spot of Evil Sunz Scarlet. 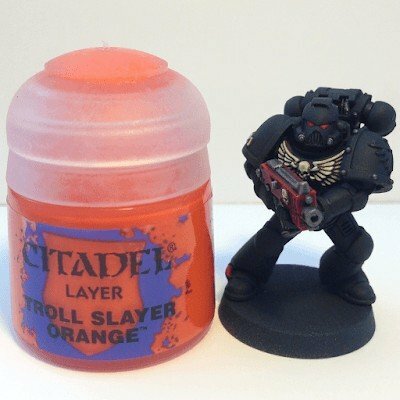 Here we apply only 2 tiny spots of Troll Slayer Orange, look face on as you apply this as you can easily end up with a googly-eyed Space Marine (can’t imagine I’m gonna need a new pot of this for quite some time) Also;“We can rebuild him. We have the technology.” Glue. Note: I rebuild around this stage so I can clearly see where the edge highlights are going to go. 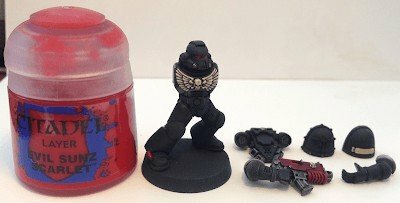 This is the long process of edge highlighting. Edge highlighting is a technique which kind of goes in the opposite direction of the Zenthial shading we did in the first place, but this gives you an idea of where you should focus your lighting lines, (I just highlighted all the edges anyway, I’ve and just focused on the upper edges more in the more recent ones I’ve done). It’s easy to screw this up by painting any part of the armour which you don’t want paint on, because this can totally ruin the awesome airbrush work you did. Slow and steady here! 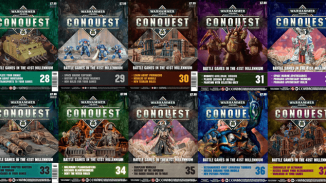 Note; 2 images here so you can get a better idea of the actual model colours, I have inconsistent lighting in my photos because I paint in my conservatory. so one without direct flash and one with. 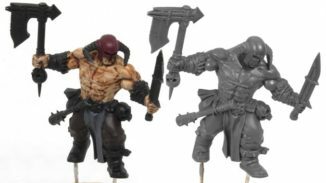 Back to White Scar, again thin this (I wonder how many times I’ve used the word “thin” in this article? (Ctrl+F “Thin” – heh, 20 times already). Paint the left half (your left) of the Sword and the upper edges of the wing spines. Also, put 2 tiny points in the back of the eyes. Finally, just to finish we’re painting “points” again, using Ironbreaker on the top edges of the metal areas. 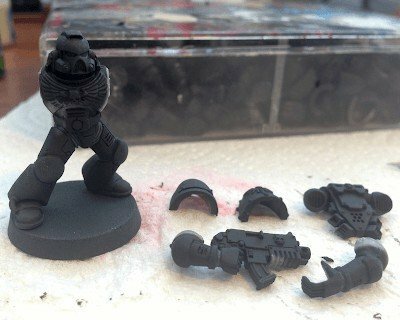 So, with that done, Here are some more Pics and a Video of the finished model along with the rest of the Squad in progress. The rest of the Squad, this is a standard (classic, pre-2000) box of tactical marines with the modern Dark Angels Customisation parts. Just need to decide on a basing Scheme (probably sand) and decide where they fit in the army so I can add decals and write on the parchment. Also, I swapped the silver metal for a Brass style because I think it fits the Dark Angels ornamentation better and compliments the green really well. 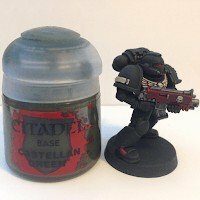 What did you think of my Painting Dark Angels guide? please let me know in the comments.